Discover six parks that go above and beyond with kid-friendly attractions. 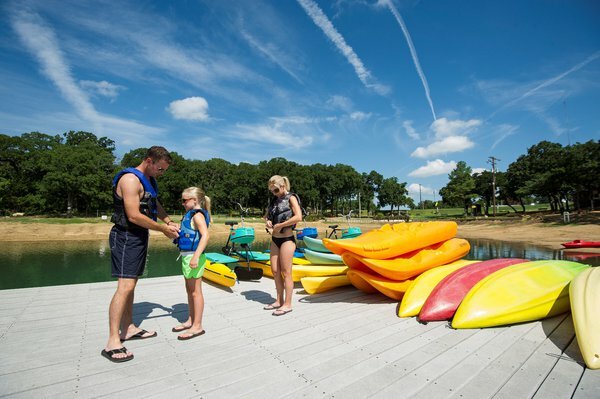 Canoes, kayaks, stand up paddleboards and paddle boats are available for rent at Lake Murray State Park in Ardmore. Families have been making memories at Oklahoma’s state parks since 1938, and it’s no wonder why. With tons of on-site activities and outdoor adventures, planning an affordable, kid-friendly vacation has never been easier. Use this guide to plan the perfect family getaway at six state parks across Oklahoma. Watch your child’s eyes light up with amazement with all the kid-friendly attractions available at Lake Murray State Park. Cool off on a hot day by bouncing on the water trampoline and zipping down the water slide at Lake Murray Water Sports. Then, pack up your little adventurer and splash across Lake Murray with a fun paddleboat, canoe, kayak, water bike or sailboat ride. Once you get your land legs back, challenge your family to a competitive game of miniature golf and treat everyone to a sugary sweet sno cone. Book a cabin or lodge room stay at Sequoyah State Park and your little tykes will have a great time wading into the zero-entry pool and getting soaked at the nearby splash pad. Head over to the playground to dry off on the swings before saddling up and taking a guided horseback ride with Sequoyah Riding Stables. Cowpokes under five can ride double with mommy or daddy, and u-lead pony rides are always a big hit. At night, snuggle up in bunk beds for a late night storytelling session. Slather on the sunscreen and get ready for a day of off-the-chart family fun at Lake Wister State Park’s amazing spray park. Set on a concrete pad decorated with bright red, yellow and blue diamonds, this splash pad is a favorite destination for children of all ages. Watch as the water dumps, squirts, splashes and drenches children and adults alike. Later, dry off around a crackling campfire perfect for roasting marshmallows and making s’mores. Legends loom large at Robbers Cave State Park where notorious outlaws Belle Starr and Jesse James sought refuge in the mid-1800s. Play a game of cops and robbers amidst the craggy outcroppings as you explore the park’s namesake cave, then hop over to Lake Carlton for a round of miniature golf, a cool dip in the swimming pool or a trip around the lake on a paddleboat. Skip over to the Nature Center to see what fun games are going on during your stay. Guided nature walks and good old-fashioned hayrides around the park are always huge hits. Pack your rod and reel for a relaxing day of fishing at the kids’ fishing pond at Tenkiller State Park. Open to children 16 and under, this is a great way for children to experience the thrill of fishing without needing to shell out for a fishing license. Let your youngster’s creativity shine with a fun arts and crafts class at the Nature Center where they can build pine cone bird feeders and let their imagination run wild with the life-sized diorama of local plants and animals. Then head to the swimming pool and see who can make the biggest splash from the diving board. All aboard for a fun family outing! Located within Beavers Bend State Park, you can take the ride of a lifetime on a 1/3 size replica of an 1863 train that winds around Wahoo Hill and crosses under a tunnel at Beavers Bend Depot & Stables. Continue your outdoor adventure with a guided horseback ride followed by a delicious sno cone eaten while dipping your feet right in the water. For even more fun on the lake, rent a paddleboat or canoe and find a shady spot for an afternoon picnic. Once the sun sets, gather the family around to watch the stars and listen to the croaking of frogs on the river.